During my Christmas holiday, I’ve largely indulged two things for which my appetite is large — Marvel superhero films* and the world(s) of fantasy. The latter has taken the form of The Ring of Words: Tolkien and the Oxford English Dictionary, A Short History of Fantasy, Terry Pratchett’s sci-fi novel Strata (with a classic, garish Pratchett cover) and currently The Complete Fairy Tales of George MacDonald — the Penguin edition, edited by U C Knoepflmacher. You’d think that a professor of English at Princeton who has written such books as Ventures into Childland: Victorians, Fairy Tales, and Femininity and Forbidden Journeys: Fairy Tales and Fantasies by Victorian Women Writers wouldn’t make the error I’m about to highlight, but perhaps Prof. Knoepflmacher is more interested in the alleged asexuality of MacDonald’s characters and other gender issues than philology (although the introduction is, by and large, very good). I, on the other hand, prefer philology. The error Knoepflmacher (who has a tremendous name!) is to inform the reader that the first three MacDonald fairy tales in the collection, ‘The Light Princess’, ‘The Shadows’, and ‘The Giant’s Heart’, are not really ‘fairy tales’, there being no fairies in them. Alas that a distinguished professor who probably writes interesting literary criticism could fall so easily into the trap set for all readers by what C S Lewis calls the ‘dangerous sense’ of a word (in Studies in Words). A word’s dangerous sense is the commonest sense in current use that could easily be confused with other and older senses that context cannot immediately reveal to the reader. A ‘fairy story’ or ‘fairy tale’ is not a story or tale about fairies. It is, as Tolkien makes clear in his essay ‘On Fairy Stories’ (in Tree and Leaf), a story or tale about fairy. Most contemporary writers of fantasy try to disassociate these two senses of fairy by using the alternate spelling faerie or a variation thereof. This sense is not about ‘those little twinkly guys’ — not about Oberon or Puck or Tinkerbell or the Man with the Thistle-Down Hair — but about the realm of fairy, of Faerie. Here, etymology actually saves us, rather than leading us down the terrible path of the Etymological Fallacy, so common to undergrads and popular preachers, that the oldest or root meaning of a word is its truest meaning or ever-present meaning in time of trouble. In this case, the stories we term ‘fairy tales’ are clearly tales about faerie not fairies. Take, for example, Hans Christian Andersen’s ‘The Little Mermaid.’ There are no fairies in this tale, but it is about mermaids and witches and magic. Or the Grimm version of ‘Cinderella’ (vs the earlier version of Perrault or the later version of Disney with the Fairy Godmother) with the supernatural intervention of Cinderella’s mother and a bunch of birds. Or ‘Little Red Riding Hood’. Or ‘The Fir Tree’. These tales are not about fairies, but the subject is very much faerie. Faerie is the land where fairies dwell. It is the Other World. It is a place inhabited not just by pixies and sprites or the Good Folk or Tolkienesque elves but also by dwarves and unicorns and trolls and sorcerers and witches and magic swords and singing mountains and talking wolves and giants and sentient trees and so on and so forth. 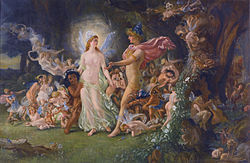 The spirit of faerie need not be bound to some other locale, some pseudo-physical difference in spatiality but, rather, is to be found wherever the folk of faerie, from Puck and Peter Pan to Poseidon and Pippin. And, of course, if faerie’s boundaries are not fixed spatially, then the otherplace can be right here. Right now. In your living room. Or cubicle. Or on the subway as you make your way home from work. Perhaps magic and faerie and all suchlike are to be found everywhere. *Iron Man 2, Thor, Captain America, Avengers Assemble (because this is Britain), and The Incredible Hulk. This entry was posted in Books, Literature, Science Fiction and Fantasy, Words and tagged cs lewis, faerie, fairies, fairy, fairy tales, fantasy, george macdonald, the complete fairy tales, tolkien, u c knoepflmacher on January 2, 2013 by MJH. For Christmas, I received a copy of the interesting and pleasant-to-read C. S. Lewis’s Lost Aeneid. When I noted a copy lying about my PhD supervisor’s office, he remarked that he’s not sure it’s how he would translate the Aeneid. Indeed, neither am I. But the thing I remarked is a very remarkable thing. Lewis’ translation, if you go through the various bits of introductory material provided by the editors, tries to stand in the same tradition as earlier, mediaeval translations of Classical literature. Lewis did not believe in trying to reproduce for the modern reader a similar effect as for the ancients — it was unattainable. He also believed firmly in rhythmic poetry, rhyme-schemes, and traditional English effects — neither foisting upon English a foreign poetry nor foisting upon ancient poetry modernist poetry. Lewis was a medievalist of a sort that barely exists anymore. I don’t mean simply that he was an academic medievalist who sought to interpret and communicate medieval history, arts, and culture for today’s world, as several persons of my acquaintance are. I mean, rather, that he created new art inspired by and, at times, modelled on the arts and worldview of the medievals. Dorothy L. Sayers, one of Lewis’ friends (learn more about her here), translated Dante’s Divine Comedy into rhythmic, rhyming verse, something many modern translators would shudder at. Yet in so doing, she produced for the modern English reader a version of Dante that bears Dante’s content and communicates the beauty and force of the Comedy‘s poetry. J. R. R. Tolkien, another of Lewis’ friends, created his world-famous The Lord of the Rings trilogy, which is a modern novel that, I believe, draws much of its inspiration from the sagas and romances of the western Middle Ages — in a way, it is a mediaeval romance for moderns. One of his posthumous works, The Legend of Sigurd and Gudrun (I’ve blogged about it here and here) takes the disparate bits of mediaeval Norse legend and puts them together in a coherent whole — not as a novel, as perhaps I would go about it, but as two narrative poems written in Old English versification (but in modern English), as well as a third that’s actually in Old English. Another contemporary of Lewis, Tolkien, and Sayers was (is?) Pauline Baynes, the illustrator of Narnia, who Lewis felt drew too prettily for her own good. 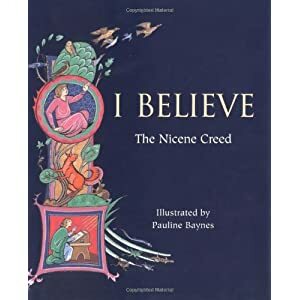 Her art is self-consciously mediaeval, modelling itself upon the aesthetic of Anglo-Saxon and Persian manuscripts — a good example of what she can do with a broad canvas is her colourfully-illustrated Nicene Creed, I Believe. 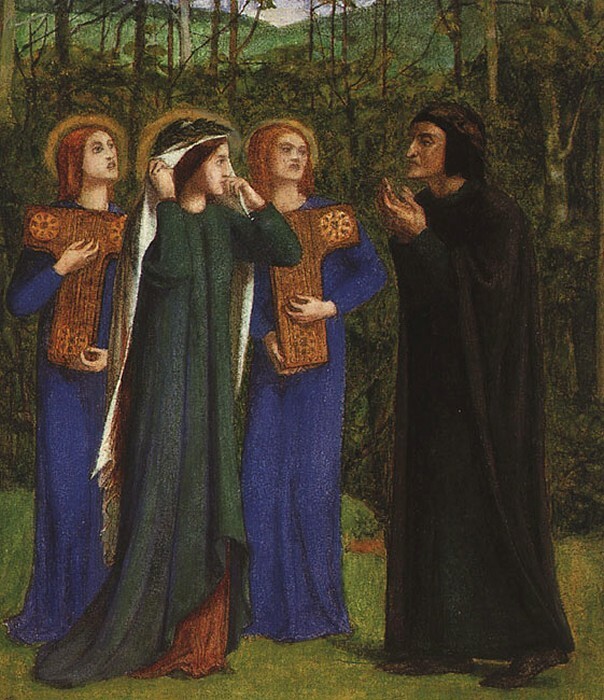 In the years before these Oxbridge scholars were producing their novels and translations, the Pre-Raphaelite Brotherhood was creating art consciously in opposition to the trends of much of the high arts of the day, seeking to imitate the style and use of colour predominant in older, Late Medieval art. 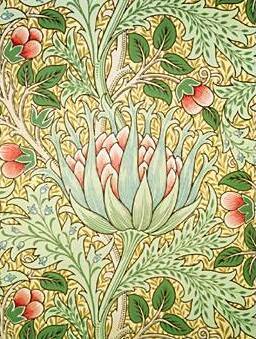 William Morris, a contemporary and friend of the Pre-Raphaelites, was a founder of the Arts & Crafts Movement; his company designed wallpapers, tapestries, objects, furnishings, textiles, and stained glass, much of which was inspired by a more ‘mediaeval’ aesthetic. Not only did he hire ‘mediaevalising’ Pre-Raphaelites as stained-glass designers for his company, he even produced Arthurian and chivalric poetry in old-fashioned English verse. While much of today’s stained glass feels hopelessly (post)modern, Victorian and early-twentieth-century stained glass feels beautifully mediaeval. I recommended testing this hypothesis in any church old enough. Beardsley, yet another Victorian, produced his masterful woodcuts for Malory’s Le Morte D’Arthur, clearly inspired by mediaeval illuminations. Another example of Victorian mediaevalism was the decision to hold a tournament. But, being Victorians and not real mediaevals, they cancelled it due to rain. I hear that one can find images of them in their mediaeval garb with umbrellas over their heads. What do we get? Who tries to produce contemporary art that wishes to be imbued by the spirit of a bygone age? Modern stained glass is helplessly modern. Illustration turns to my beloved Quentin Blake, which is fine, but why not have a Pauline Baynes in the ranks alongside him? Where has metrical verse gone? Or the wild rumpus of medieval romance? The true Romance of romance! Alas, have we seen the last of such artistic practitioners in the ranks of the Inklings? Since writing this post a couple of months ago, but being unable to post until now, I have read Simon Armitage’s The Death of King Arthur, his modern English version of The Alliterative Morte Arthur, a Middle English alliterative poem. His translation is also in alliterative verse, and it brought joy and hope to my heart. This entry was posted in Art, Books, Literature, Mediaeval and tagged aubrey beardsley, cs lewis, cs lewis's lost aeneid, dante, dante gabriel rossetti, dorothy l sayers, inklings, jrr tolkien, legend of sigurd and gudrun, lord of the rings, medievalism, pauline baynes, pre-raphaelite brotherhood, simon armitage, the death of king arthur, the divine comedy, william morris on March 18, 2012 by MJH.